Please excuse my crappy pun. When making screen mockups for this blog, I found I needed a font to use for message log entries. After a half-hearted search on line, I decided it would be more fun to make my own - this being the result. 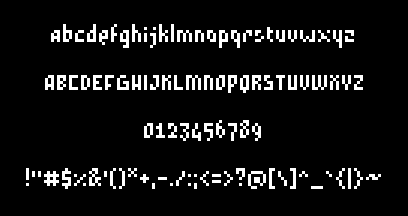 When designing the font I wanted it to work on the same scale as the tiles, having a maximum height of 8 pixels. I also wanted it to be as compact as possible horizontally and legible at small sizes. I've had a rough draft in photoshop for a while that I would tediously cut and paste into sentences, but this week I took the plunge and tried my had and creating a proper ttf font. This meant coming up with the additional punctuation and symbols needed to make up the standard Latin glyph set, and then redrawing the whole lot as vectors in font creation software. I've still a bit of work to do to get it rendering crisply at all the point sizes, but it should be ready to include in the next download. If anyone knows anything about font creation and 'Hinting' gimmie a shout, I could use the help. Jumpy halfling dwarves pick quartz box. A wizard's job is to vex chumps quickly in fog. Painful zombies quickly watch a jinxed graveyard. Here are a few mock-ups of four tile boss monsters, like you get in Legends of Yore. I know its not orthodox roguelike, but it's kind of an inevitable consequence of having such small tiles. Try as I might, I'll never fit a convincing dragon into a single tile, will I? In Legends of Yore boss monsters pursue you, breaking down walls when necessary, but the opposite approach of having them trapped into certain areas could also work provided they have some means to attack hiding snipers. It would make the player nervous if they descend to a level with lots of double width corridors, especially if there are little scorpions scuttling about. Although giant monstrosities aren't a must, I think if used sparingly they add some scale and variety to the bestiary. What do you think peeps, is anyone interested in having more of these? P.S. - on this bottom image of the scorpions I have experimented a little with the representation of corpses. A quarter turn of rotation and a bit of desaturation and darkening does the trick quite nicely I think. I've just been tinkering with the monkey sprites I already had to make some cheap (but fun) variations. Whats more terrifying than a vicious blood thirsty ape? A bloodthirsty ape with wings! I might do a colour change on these to make some gargoyles or something later on. ...I don't know how you could justify the bellhop apes in game, but I'm sure someone will find an excuse. No real topic for this post, I've just been playing around with the tiles. I quite enjoy setting up little dioramas using the various charicters and scenery, I don't know how hard it would be to duplicate this kind of theming using procedural generation techneques but I think it would be worth the effort. With a well made quest generator, it could breath a lot of life into a tiny game. There are a few extra bits and pieces in these images that i haven't blogged yet, some from V0.2 and some that will be in the next release. I'm sure alarms are included in a fair few roguelikes, and if not they should be. A simple thing like having to fell a monster before he calls his mates, or drawing a tough beast to one side of a level while you sneak down a side passage adds a great deal of immersion and drama whilst playing. So far I have only thought of a few objects to act as alarms, bells gongs and horns. If I can think of more i'll add them. Head over to the download section now to have a butchers for yourself. As always your feedback is much appreciated, and if you get anything working with the tiles don't forget to let me know, I'd love to hear about your project. eight2empire tileset by Thomas Whetnall is licensed under a Creative Commons Attribution-NonCommercial-NoDerivs 3.0 Unported License.